Just east of Holborn Viaduct Station turn into Old Bailey. Bishop's Court is about 30 yds on the right. The history relating to Bishop's Court is uncertain, but lying in close proximity to St Paul's Cathedral it is very likely that it had past associations with the Bishop's of London. It is thought that at some point the name of the Court was unintentionally changed. Belief has it that the name was originally Bishop's Head Court but when the nameplate was replaced the title was wrongly transcribed and the 'Head' was omitted - a common occurrence in times past. Indeed, there was an inn on this site bearing the sign of the a Bishop's Head, but the question of which came first, the bishop or the inn, is not known. Gazing mournfully upon this Court we can only muse on imaginative illusions of old times, for this place now has not a shred of characteristic beauty. The buildings are dreary and even the old Magpie and Stump public house has disappeared in modern developments. Its replacement is a contemporary edifice bearing not a shadow of resemblance to the former inn. Talking of this old tavern, George Guthrie, writing in the International Crime Magazine, 'Criminology' tells of the last public execution in London. It was of Michael Barret for his unsuccessful attempt to blow up Clerkenwell Jail. He concludes 'my favourite tavern, the Magpie and Stump, in Old Bailey, did a roaring trade that day'. Indeed, the treasured old tavern with its fine wooden panelling had a complementary character to be savoured along with the excellent food and drink on offer. In the 17th century the Magpie and Stump housed one of the 'clubs' known as mughouses, so called because every man had his own mug. These social circles became extremely popular and sprang up in taverns all over London. Nothing but ale was drunk and members were entertained, under the control of a chairman, by singers and instrumentalists. Mughouses later became more politically biased and were mainly frequented by Whigs who met to scheme against the Tories. Undoubtedly this was the access and delivery area to the Black Swan Inn, which stood on this site throughout the 19th century. Little is known of the Inn other than it was pulled down at the beginning of the 20th century to make way for warehouses and offices. It is a narrow place, although with a squeeze, just wide enough for commercial vehicular access. The Yard has once again been rebuilt and now serves for the private use of the companies occupying the modern offices here. Bermondsey Street has many tributaries although most of them are un-named. Crucifix Lane, to the north of Black Swan Yard, is a treasure in itself as it twists in a dark tunnel beneath the railway lines. A small court on the corner of Queen Victoria Street and New Bridge Street, by the Black Friar pub. A large part of Blackfriars Court, which used to continue in a northerly direction from Queen Victoria Street, has for a long time now been inaccessible. The court now consists merely of that part which passes directly in front of the Black Friar public house. The present Black Friar tavern was built in 1905 on part of the site of the 13th century Priory of the Dominican Friars who, through the colour of their habit, were known as the Black Friars. It probably features high in the ranking as London's most decorative pub with Art Nouveau design literally covering the place. There has been a tavern on this site since about 1600 but the ground beneath can reminisce of the time when it supported the foundations of the friars council chamber where kings and their councils met to change the face of history. But there is one notable meeting that took place on this site which paved the way for a change in British history such as no other has ever done. Across New Bridge Street stood the Palace of Bridewell where Henry VIII lived with his Queen, Catherine of Aragon. In 1528 as the King was pacing the boards of his palace, Cardinal Wolsey and the Papal Legate sat in the friars council chamber debating the future of the King's marriage to Catherine. Henry could do nothing but await their decision. After the lengthy discussion the only answer that could be conveyed to the King was that the matter would have to be referred to Rome, and the outcome has been told in words contained in thousands of volumes. Less than fifty years after the dissolution of the monasteries the Priory of the Blackfriars was no more than a heap of rubble and in 1596 the actor James Burbage acquired the site of the council chamber and adjoining land to build the Blackfriars Theatre. William Shakespeare had an interest in the enterprise and in 1612 bought a house in Ireland Yard for the convenience of being nearby. It is well appropriate that the first staging of Shakespeare's Henry VIII should have been acted on the very site that the momentous event took place only a few years previous. 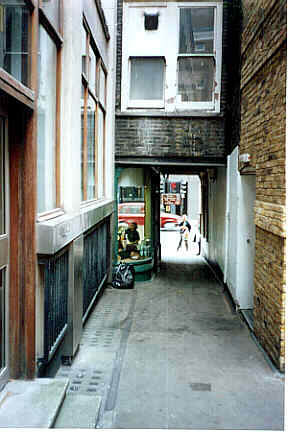 Blackfriars Court bears no resemblance to an alley or passage, there is no ornate old archway to herald its existence, neither are there any high buildings or blackened walls hiding its path, but only the backdrop of the tavern's detailed exterior. Appearing as nothing more than a chopped-off corner it is nevertheless a pleasant place laid out with a raised flower bed and four well established trees. Here also is the remaining pedestal of an old drinking fountain. On the east side of New Bridge Street approaching Blackfriars Bridge. By the underground station. Blackfriars Passage leads under the vast iron girders of Blackfriars railway bridge and passes immediately below the station platforms before emerging into Puddle Dock right opposite the Mermaid Theatre. Alongside a length of the Passage is the Blackfriars Underpass, opened in 1967 to ease the traffic congestion at the junction of Victoria Embankment with New Bridge Street. During excavation for the construction of the underpass the hull of a wooden ship was discovered, thought to have been sunk by the collapse of a wall in Roman times. From Farringdon Station cross Farringdon Road and walk along Greville Street, opposite Cowcross Street. 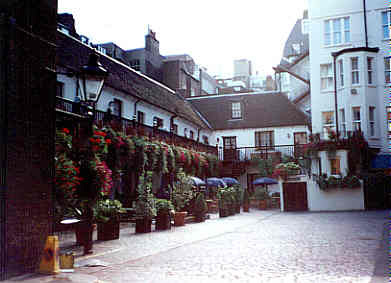 Cross Saffron Hill and Bleeding Heart Yard is about 35 yds on the left, by the New Windsor Grill. Legend has it that this gruesome sounding, nightmare instigating name comes down to the unvirtuous Lady Elizabeth Hatton. The story goes that she entered into alliance with the prince of darkness. Unfortunately, her faithfulness was lacking, with the consequence that he became increasingly dischuffed with her and on a gloomy night in 1646, while she was walking in the Yard, the Devil took his revenge. The following morning Lady Hatton was nowhere around, but it is said that a stable lad about his morning chores found her heart in the middle of the Yard, still pumping blood over the cobblestones. It is a spooky thought, but they say that to this day her ghost still returns to remove all traces of blood from the shiny cobble. However, no one has ever sighted the ghost of Lady Hatton and you may, without fear, visit the Bleeding Heart Restaurant and Wine Bar on the west side of the Yard. Two menus are on offer in the restaurant - one of snacks and the other of more substantial fare. The wine list is extensive, including vintages from many countries, and to complement the list there is a fine selection of quality ports. Bleeding Heart Yard sprang to immediate fame when Dickens stumbled on it one day and installed Mr Plornish in a house at the far end. He was quite evidently enthralled by the place and could not resist the temptation to give Daniel Doyce a workshop here. Dickens described the Yard as 'A place much changed in feature and in fortune, yet with some relish of ancient greatness about it'. Things have obviously change a great deal since the biography of Little Dorrit was written; 'the ground had so risen about Bleeding Heart Yard that you got into it down a flight of steps...'. There are no steps here now; the Yard is on a level footing with the surrounding streets, but despite the changes, with a little imagination, you can still savour the Dickensian atmosphere, Latching onto the famous author, the theme of the restaurant has much of a Dickensian flavour. There are panelled walls and a displayed collection of his books and prints... Succulent heart is not a speciality. From Holborn Station cross to the north side of Holborn and walk west crossing Southampton Row and Southampton Place. Bloomsbury Court is about 55 yds on the right just east of the fork in the road formed by High Holborn and New Oxford Street. The name of Bloomsbury with which this Court is associated comes from way back in the beginning of the 13th century when William Blemunt bought a plot of land about half a mile in width and reaching from High Holborn to St Pancras. On the land he built a large mansion with surrounding gardens and pastures; hence, Blemunts bury or Blemunts dwelling, over the years corrupted to Blomuns-bury and finally Blooms-bury. Over 300 years later, in the mid 16th century, Lord Southampton acquired the estate for his personal use but his descendant, the 4th Earl, had different ideas and saw the opportunity to increase his wealth. In about 1630 he started to develop the land by first erecting a substantial house, and stretching out along its front aspect he laid out an enclosed area, the plot we now know as Bloomsbury Square. It was the first locality in London to be designated a square and started a trend which continues to this day. The land around the square he let off for private housing development, but His Lordship was no fool. 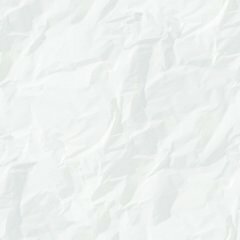 He drew up a contract defining the terms and conditions so as to leave the lessee with no uncertainties relating to his rights - if he had any. The period of lease, he alone determined, and further went on to decree that all building projects were to be fully financed by the lessee himself. For the speculative developer this alone would have been a difficult agreement to swallow but an additional clause stated that at the end of the lease period all properties, without exception, fall to the landlord. In other words, there was only one winner. Although the market was never a flourishing success it continued until 1846 when the construction of New Oxford Street was commenced. During the first half of the 19th century successive development projects along New Oxford Street have replaced the old buildings and the Street now is relatively modern. Between the Nationwide Building Society and the TSB, a sign on the edge of the pavement points the way to Bloomsbury Court. Now that the market is gone and the chambers of Mr Spong have long since fallen to dust there is little here to impress the casual stroller. But, perhaps, for those who pulsate with excitement over the simpler aspects of illuminatory features, there is a solitary standard lamp in the centre of the walkway. From Piccadilly Circus walk north east along Shaftsbury Avenue, crossing Gt Windmill Street, and at the next junction turn left into Rupert Street, cross Archer Street and Brewer Street and walk through Walker's Court, directly opposite. Continue into Berwick Street and Blore Court is a few yds on right. If Edward Blore, the man who did so much delicate work on Buckingham Palace and Westminster Abbey, had divine knowledge of this specimen to his memorial he would have turned face down in his grave. Blore Court is a cul-de-sac, dingy, unkept and most of the time obliterated from view by the stalls of Berwick Street market. It has rough brick walls and the paving is uneven. Adjoining, 'Quaff Records' have an advertising board just inside the entrance. Definitely worth a look but don't expect to linger. From Green Park Station (Piccadilly south side) walk east towards Piccadilly Circus for about 200 yds, crossing Arlington Street and then turn right into St James's Street. Walk along the west side for about 200 yds crossing Bennett Street and Park Place. Blue Ball Yard is on the right between numbers 63 and 64. A covered access from St James's Street leads into this wide picturesque yard where many of the buildings are adorned with attractive foliage. Blue Ball Yard has been here since at least 1680 when it partly consisted of a row of small dwellings, probably housing servants of the aristocracy who loved to boast of their royal neighbours at St James's Palace. At that time it was called Stable Yard being the place where carriage horses of the 'royal neighbours' were stabled. Its name was changed, probably in memorium, when the Blue Ball Tavern in St James's Street was demolished in the late 18th century. Still surviving, on the left of the Yard, are some interesting stables of 1741 and above the stables are flats with a balcony supported on wooden brackets. The cobble stones which once served to prevent the horses slipping are now car parking bays for 'authorised vehicles'. To the south of Blue Ball Yard, at number 69 St James's Street, is the Carlton Club. Founded by the Duke of Wellington in 1832, it became the principal establishment for Conservative Party gatherings. The site was once occupied by Arthur's Club but the Carlton moved here after their premises on Pall Mall were bombed in World War II. About 220 yds from Ludgate Circus on the north side of Fleet Street. Curious Bolt Court takes its name from the 'Bolt in Tun Tavern' which stood on the opposite side of Fleet Street, on the corner of Bouverie Street. 'Bolt', in this peculiar title, is presumably a bolt as fired from a gun or possibly an arrow. A 'tun' is a large wine cask with a capacity of 252 gallons. From the yard of this one-time famous old coaching inn, coaches rumbled out into the density of horse drawn traffic in treacherous Fleet Street en route to places as far afield as Cambridge, Lincoln and Winchester. To add to its fame the 'Bolt in Tun' was the scene of tears of sadness and drunken celebration as the final long distance stage to leave London rattled through the gates of its yard. For a long time, after the inn was demolished, the yard continued to house the properties of sundry small businesses and provided space for off-street parking, but the site was built on in 1950 and all trace of the yard has now completely disappeared. Another derivation of the name suggests that the entrance to the Court had a gate which was bolted at night to keep out thieves. A rather unlikely implication. That crotchety old genius, Dr Johnson moved from number seven Johnson's Court to take up residence at number eight Bolt Court in 1776 'still keeping to his favourite Fleet Street'. When James Boswell called on his great friend at the doctor's house in Johnson's Court on the 15th March you could have knocked him down with a feather when he found out that the man was no longer living there. He recorded the event of the removal in these words: 'I felt a foolish regret that he had left a court which bore his name; but it was not foolish to be affected with some tenderness of regard for a place in which I had seen him a great deal, from whence I had often issued a better and a happier man than when I went in, and which had often appeared to my imagination, while I trod its pavement in the solemn darkness of the night, to be sacred to wisdom and piety.' The last time that Boswell saw Johnson was on the 30th June 1784 at the Fleet Street entrance to Bolt Court. As Johnson climbed down from the coach in which they had returned from dining with Sir Joshua Reynolds he called out to his friend 'Fare you well' and made off, 'with a kind of pathetic briskness', down the dark alley to his house. Two days later Boswell set out on a business trip to his native Scotland and was not to return to London before Johnson's death on the 13th December 1784. All the old properties have long been demolished but a plaque marks the site of the Doctors house. The Stationers Company established a school for boys here in 1861. It later moved to Hornsey. Bus: Any to the Bank or Cannon St. When John Stow tasted the water from the Walbrook stream and declared it 'a fair brook of sweet water' it is quite clear that he had been handsomely paid by the local authority. For over 200 years before the event, residents of its banks had been complaining about the stench emitted from its murky shallows. So bad was the problem of pollution that by the mid 1300's part of the brook had already been relegated to a sewer by arching it over with bricks. In the course of the on-going grumblings between citizens and council, the Bond family would have been at the heart of the dispute, taking the rough edge of the flack. They had been prominent in the administration of the City for many years and in 1585 George Bond was elected as Alderman for the Walbrook ward, which he continued to represent until 1592. At the time of his election, George was in residence at Crosby Hall, occupying pride of place in the precincts of St Helen's, Bishopsgate, which he had purchased from Sir Thomas D'Arcy in 1566. However, at some point during his term of office, he built a house on the east side of the stinking stream which he periodically used as a base - most probably to prove a point. If this was his idea then it quite evidently failed to convince, for before he could step down from office the entire length of the Walbrook was bricked over 'and paved with stone... that no man may by the eye discern it'. Bond Court, originally Bond's Court, is not a homely place any more - if it ever was, but more representative of a large modern yard housing multi-storey office buildings. A traffic barrier at the entrance to the Court prevents unauthorised admittance and all comings and goings are scrutinised by the ever-watchful security guard in his little hut. On the east side of Bishopsgate, opposite Liverpool Street turn into Devonshire Row which leads to Devonshire Square. Borer's Passage leads from the east side of the square. So much development has taken place in these quarters over recent years that some of the latter- day narrow passages are now unrecognisable as their former selves. The division between Devonshire Square and Borer's Passage is almost indistinguishable as it passes between modern office buildings on the south side, and Cutlers Gardens to the north. Harrow Street, at the end of the Passage, leads into the thick of Petticoat Lane Market (Middlesex Street). The Passage was originally named Aggate's Passage after a previous resident. It was later altered to Aggate Passage and then in 1831 it was given its present name - from where I know not.